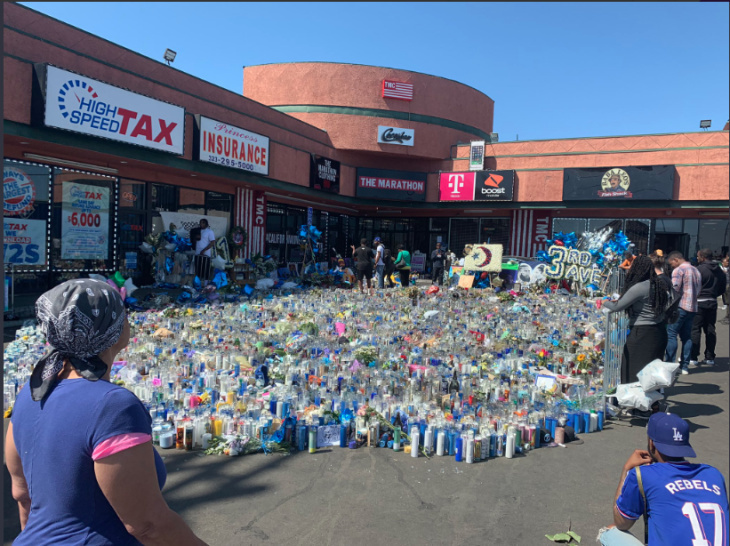 Fans and supporters of the late rapper and community activist Nipsey Hussle gathered Thursday to celebrate his life and mourn his death. The official service was scheduled to begin at 10 a.m. and end at noon at Staples Center. Instead, it kicked off about an hour late and lasted longer than scheduled. 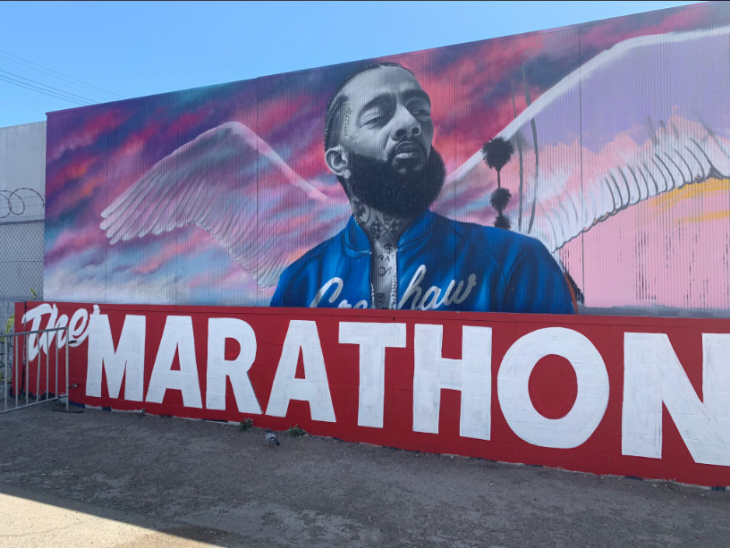 Following the service, a funeral procession led by a hearse carrying Hussle's body and followed by cars holding his family and friends left downtown L.A. on an hours long journey through the South L.A. neighborhoods where Hussle was considered a community hero. 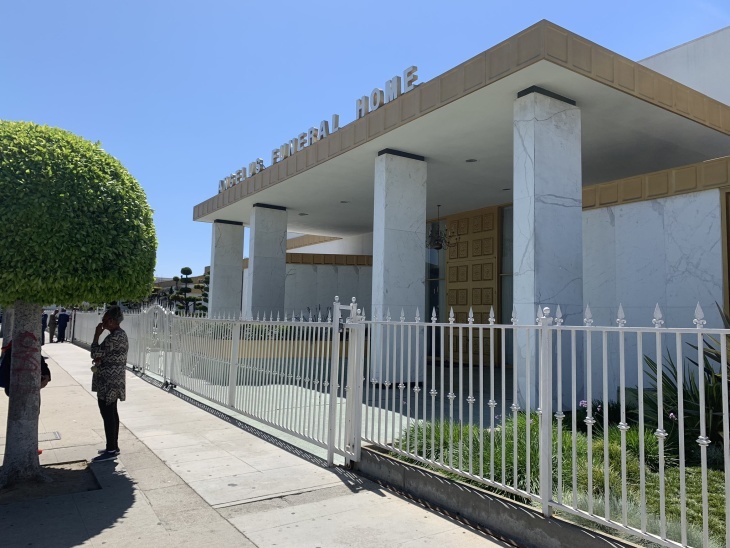 The more than 25 mile route ended at the Angelus Funeral Home on Crenshaw and 39th Street just before 7:30 p.m.
"I've never met Nipsey, but I've heard his music through my daughters. After his passing, I had the chance to learn more about this community work...Nipsey saw potential. He saw hope. He saw a community that, even through its flaws, taught him to always keep going...He set an example for young people to follow, and is a legacy worthy of celebration. I hope his memory inspires more good work in Crenshaw and communities like it. Michelle and I send our deepest sympathies to Lauren, Emani, Kross and all those who loved Nipsey." Later in the ceremony, Hussle's partner, Lauren London appeared onstage with her children, including her young son with Hussle. Members of the crowd shouted, "we love you Lauren" and "stay strong." London's son, Kameron Carter, delivered a tribute to Hussle. Kameron told the crowd "Ermias" (his birth name) always started the day by looking out the window and saying "Respect." He urged the crowd to shout "respect!" on his countdown of three. Angelique Smith, Hussle's mother, told the crowd, "I have perfect peace...I am happy, and if I can feel this way, so can you." "I'm very proud of my son," she said. "My son, Ermias Joseph Asghedom, was a great man." London said of her love: "His soul was majestic. He was the strongest man I ever knew." Pastor Shep Crawford was last to speak. He said that Nipsey Hussle was anointed by God. "He got Bloods and Crips walking together," he said to cheers from the crowd. "This man has changed this city forever, and now he lives in you." Hussle, a Grammy-nominated artist, was fatally shot on March 31 on West Slauson Avenue outside his shop, The Marathon Clothing. Mourners began gathering at the site in the hours after word spread in the neighborhood. By the next day, a growing memorial was drawing big crowds and something sparked those gathered to flee. The situation escalated into a stampede — 19 attendees were taken to the hospital. Live news coverage showed people running in a panic from the scene, leaving behind broken candles, shoes and other debris. On Wednesday, Mayor Garcetti told KNX that the city would ensure that things would be safe at the memorial, but an LAPD spokesperson told LAist that police officers would not have a prescence at the Staples Center because the venue has their own security. Additionally, LAPD told us that they do not have plans to provide the security at the procession because it's a privately-run event. According to Staples Center's event website, all attendees of the memorial service had to enter through standard event security, including metal detectors and bag checks. Cameras and recording devices were not allowed in the venue, "out of respect for the family." Free tickets to the memorial were originally released online on a first-come-first-serve basis for California residents, but quickly ran out due to high demand. Three hours later, scalpers were already selling them on Craigslist for upwards of $1,000. The memorial was live-streamed online, however. As for the procession, details are sparse. 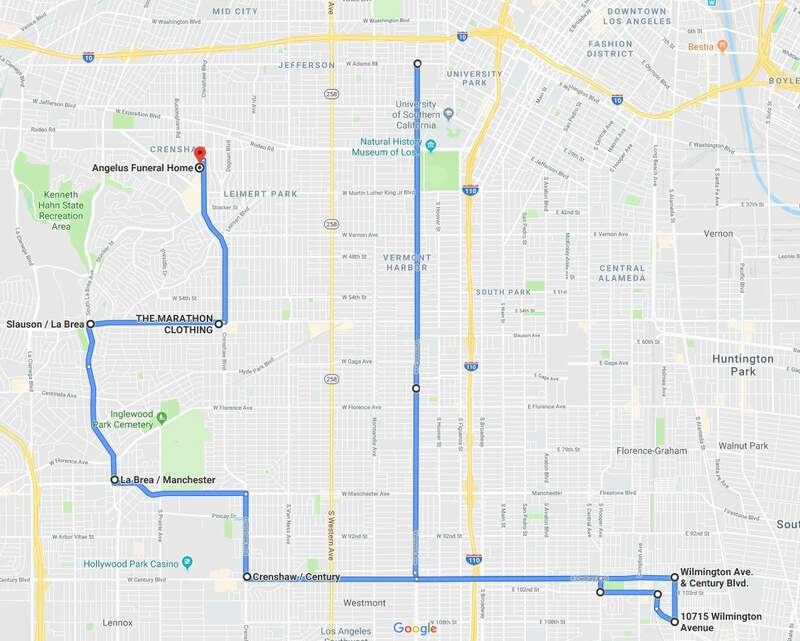 There is a map of the planned route posted on the Staples Center website, but it has not been confirmed by Hussle's family, who is organizing the event. After the Staples Center event ended, people began flooding the streets where they expect the procession to go. Some neighborhood businesses along the planned route, like Steve's Barber Shop, say they'll probably close during the procession. But across the street, two long-time businesses that say Hussle was a frequent customer — Slauson Donuts and Hungry Harold's — will keep their doors open for hungry procession goers. KPCC/LAist reporters are in the area and will provide updates from the field throughout the day. Check back for more. Hussle's single "Victory Lap" is reportedly playing as people wait for the service to begin. A small scuffle may have ensued, but seems as though it didn't escalate, reports KPCC's Austin Cross. April 11, 12:57 p.m.: This article was updated with comment from Lauren London, Hussle's partner. April 11, 12:20 p.m.: This article was updated with an appearance by Lauren London, Hussle's partner; and comment from Angelique Smith, Hussle's mother. April 11, 11:21 a.m.: This article was updated with a letter from President Barack Obama, and a link to the memorial's live-stream. April 11, 2:22 p.m.: This article was updated with final quotes from the memorial service. This article was originally published on April 11, 2019 at 6:20 a.m.